Posted on June 18, 2009 . For the coming summer season I just bought this cheap waterproof (5m/15ft) case: the Aquapac 404. For less than 30â‚¬, the 404 is small enough to fit my Vado HD camcorder, my mobile phone (does 3G work for some Qik realtime streaming underwater ?!?) or my p&s camera. The product comes with an adjustable neckcord, 5 dessiccant sachets (to help absorb any condensation in the air inside the case) and a three-year global warranty. 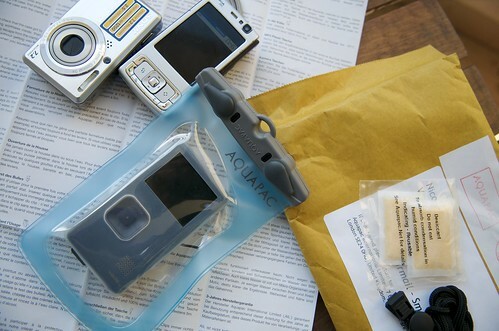 Aquapac sells waterproof cases for everything and at reasonable prices, go take a look at their sizing guide. After some bubble tests here at home I’m hopefully using it on the beach in a couple of weeks!